Order must be marked "Same Day Rush"
Order must be marked "Three Day Rush"
NON-RUSH production time for applicable items is five working days after art approval. P.O. must state in hands date. Camera ready artwork is suggested. However, we will help you with your specific needs. Please list all necessary instructions including colors, placement, orientation, etc. Credit terms need to be approved before production can begin. Fax or email art proofs are provided and must be approved before production can begin. Rush pricing DOES NOT include freight charges. 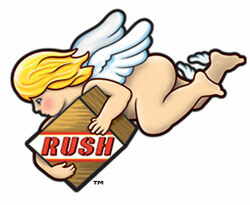 Rush service is for catalog quantities. For larger quantities, call customer service.